Preservation of capital is one of the primary investment objectives of institutions and private investors alike. It is important to participate in the market when it is rising. But when markets decline it is more important to protect invested assets. 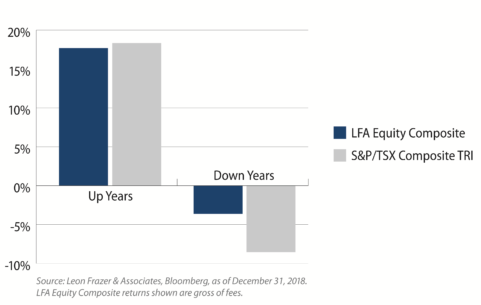 This chart shows that over the past 50 years Leon Frazer’s equity clients were sheltered from significant declines in the S&P/TSX Composite Index while still participating in most of the upside in the market. This protection of asset values in down markets is another advantage of Leon Frazer’s investment style. Upside capture measures how well an investment manager performs compared to an index during periods where the index has risen. A number above 100 indicates that the investment manager tends to capture more upside (performs better) than the index when markets are up while a number below 100 indicates that the investment manager tends to capture less upside (performs worse) when markets are up. Downside capture measures how well an investment manager performs compared to an index during periods where the index has fallen. A number above 100 indicates that the manager tends to capture more downside (performs worse) than the index when markets are down while a number below 100 indicates that the investment manager tends to capture less downside (performs better) than the index when markets are down.